I grew up in Stillwater, Minnesota on a hobby farm with horses, rabbits, dogs, and a goat. Throughout my childhood I was involved in several activities like: 4-H, band, orchestra, and volunteering at the hospital. Additionally, every summer I would help my dad set up his classroom for the following school year. He was a 4th grade teacher. I graduated from the University of North Dakota - Grand Forks with a Bachelor of Science in Biology and Chemistry. I also completed my Masters in Teaching through City University and I am highly qualified to teach math and science. I am married to my wonderful husband Dan who I have known since 1999. The interesting thing about my husband and I is that we went to middle school and high school together without knowing one another until after we graduated. In case you can't tell by the pictures one of my hobbies is scuba diving. 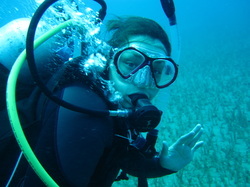 My husband and I went to Fiji February 2012 for a scuba diving trip where we did 12 dives in 5 days. We are completely addicted to the world under the water! On April 12, 2015 we were blessed to have our first child. His name is Lincoln John. He started preschool this year and just loves to learn how things work. He always wants to take things apart and then put it back together. Our second son was born March 22, 2017. His name is Leo Franklin. Whenever people see him they always say "look at those dimples". Sometimes we call him Mr. Dimples because he smiles so much. This past summer we hung out at home quite a bit and spent time at the zoo, OMSI, swimming and playgrounds. We also made a trip up to Seattle and went to the aquarium which our boys loved and we went and saw Thomas the Train. We also have a Golden Retriever who is 1.5 years old. Her name is Piper and is actually only a month older than Leo. I'm looking forward to a wonderful year of teaching Pre-Algebra and Algebra. If you have any questions or concerns please feel free to email or call me anytime.